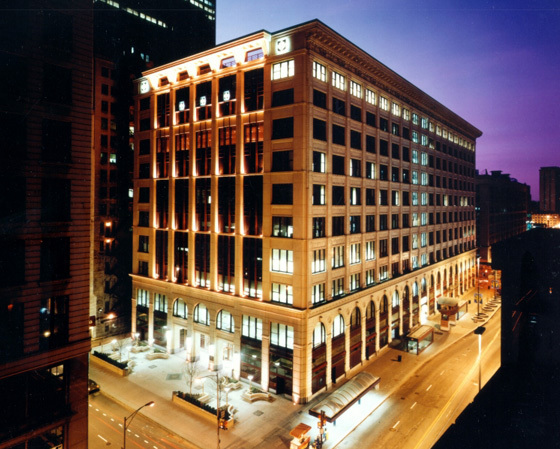 After lying vacant for twelve years, this former 650,000 SF department store building was converted into the anchor facility for DePaul University's downtown campus and the now burgeoning south loop educational district. An important design objective was to establish a strong urban identity for the University that reinforces the commitment to provide access to excellent opportunity in urban education. Classrooms, Faculty and Departmental Offices, a Conference Center and a Student Cafeteria and Services Center occupy the upper floors of the building. Office spaces for the City of Chicago occupy the lower floors and provide future growth space for the University. Retail space organized around a central gallery, and an atrium enlivens the ground floor of the building while generating rental income. A key design intention of this award winning project was the creation of an open and inviting environment, and the overall image of a major institution of higher education. The creation of an exterior Entry Plaza and a new north façade completed the internal transformation of the now 80 year old building into a bustling, urban university center.